Using the same ground chicken, cheddar and apple mixture I used for stuffed mushrooms and meatballs, I made them into sliders too! This just goes to show how versatile this recipe is and can be applied to any of your favorite meatball recipes too. Friends and I especially liked how moist this turned out and it's a nice alternative to beef sliders. If you wanted to, you could even top the chicken sliders with more toppings or make them into full burgers. I plan on making these again for upcoming game day get togethers! Peel and core the apples and place on a cookie sheet. Drizzle with olive oil and sprinkle salt to taste. Bake in the preheated oven for 30 minutes to roast. Remove apples from the oven and place in a food processor. Process until finely chopped; set aside. *If you don't have time or want to roast apples, you're welcome to use jarred chunky applesauce. Press the chicken, cheddar and apple mixture into the bottom of a jelly roll pan or baking dish until flat and even. Bake in the preheated oven for 15-20 minutes until cooked through. Cut the baked chicken into squares, the size of your dinner rolls. Place on the dinner roll bottoms, top with the dinner roll tops and serve. Heat a skillet with cooking spray. Form the chicken mixture into small patties and fry until cooked through and both sides are browned. Place on the dinner roll bottoms, top with the dinner roll tops and serve. Form the chicken mixture into small patties and grill until cooked through and both sides are browned. Place on the dinner roll bottoms, top with the dinner roll tops and serve. This looks like a great recipe to use up the piles of apples I just picked. It looks yummy! Great dish. You're right, that is a versatile recipe. Sliders have become more "gourmet" lately. They're definitely great for the big game. Thanks for sharing. Sounds fabulous! I love the idea of making these into sliders! I just added these to my menu! What a great idea. 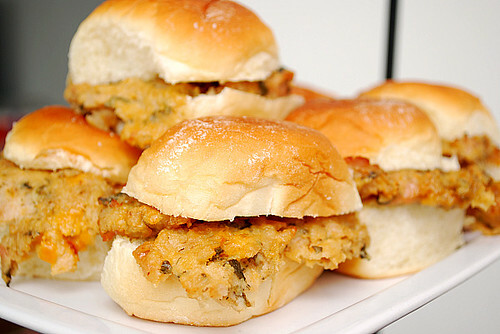 I love the apple/chicken combo -- and sliders are always so much fun! Loved this recipe! Just made it for dinner last night, and it was like a little chicken parmesan sandwich. Perfect and easy for a weekday dinner night! You rock girl! I've had apple turkey sausages before so I went I came across this recipe I knew it was a winner and that I had to try it. It was great, very delicious and husband approved. What I did differently was brine the chicken breast in apple cider and I used fresh bread crumbs which made the sliders very juicy at any temperature and it didn't dry out when reheated. I am browsing some recipe online when I got my attention in you blog I found this recipe and looks interesting. How many sliders does this make? I need to make sure to buy enough rolls!